Tackle those hard-to-reach branches with ease. The Sun Joe Saw Joe SWJ800E pole chain saw takes the danger and difficulty out of trimming your overgrown trees. Stand safely on solid ground and simply adjust Saw Joe’s telescoping pole to gain up to 15 feet of overhead reach. Powered by a 6.5-amp motor, the SWJ800E can handle the most stubborn tree limbs up to 7.5-inches thick. This pole chain saw features an 8-inch Oregon bar and chain with an auto-oiler to keep the bar and chain fully lubricated during use. Unlike gas-powered tools, Saw Joe is powered electrically, so you’ll reliably power up with the push of a button without having to deal with smoke, fumes, unpredictable starters or costly tune-ups. Plus the SWJ800E comes equipped with a built-in safety switch to prevent accidental starting. Saw Joe is CSA approved and carries a full two-year warranty. SAW WHAT YOU SEE - WITH THE ONE SAW THAT DOES DOUBLE DUTY! Tackle those hard-to-reach branches with ease. 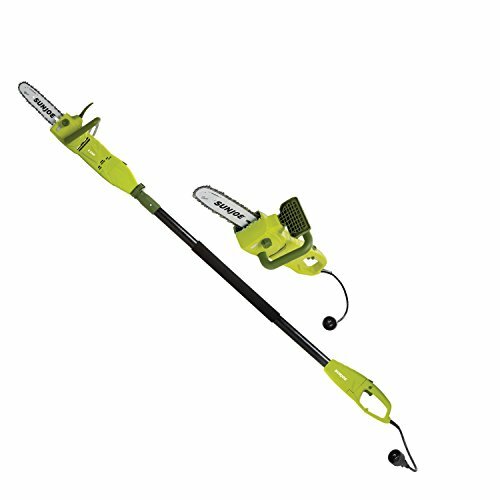 The Sun Joe SWJ807E 2-in-1 convertible electric pole chain + saw takes the danger and difficulty out of trimming your overgrown trees. Stand safely on solid ground and simply adjust the telescoping pole to gain up to 15 feet of overhead reach. Later, when the limbs are down and there's wood to be cut, the SWJ807E quickly converts to a hand-held chainsaw to make light work of loads of logs. Powered by a robust 8-amp motor, the SWJ807E can handle the most stubborn tree limbs up to 7-inches thick. It features a durable, 10-inch Sun Joe bar and chain with an auto-oiler to keep the bar and chain fully lubricated during use. Unlike gas-powered tools, SWJ807E is powered electrically, so you'll power up reliably every time with the push of a button, without having to deal with smoke, fumes, spark plugs or costly tune-ups. Plus the SWJ807E comes equipped with a built-in safety switch to prevent accidental starting. The Sun Joe SWJ807E convertible electric pole chain + saw carries a full two-year warranty. 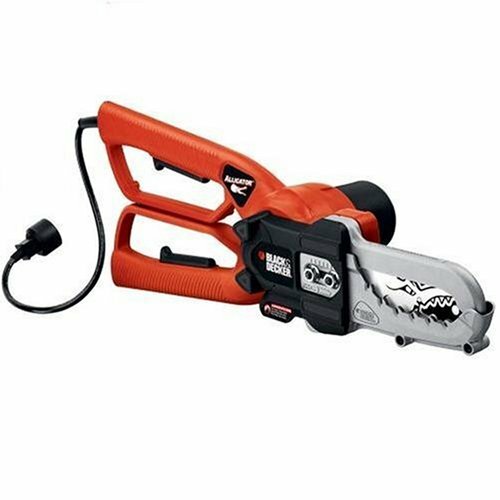 The BLACK+DECKER Bare 20V MAX Lithium Ion Pole Pruning Saw is an excellent tool, designed for pruning overhead tree branches up to 14ft high. This bare-tool is compatible with 20V MAX Lithium Ion battery which provides with a longer lifespan and 5X longer charge than similar NiCd batteries. It has an 8" cutting bar and chain that allows for a maximum cutting diameter of 6". The center extension allows For a useable length of 6.5' or 10' and provides overhead reach of up to 14 feet. 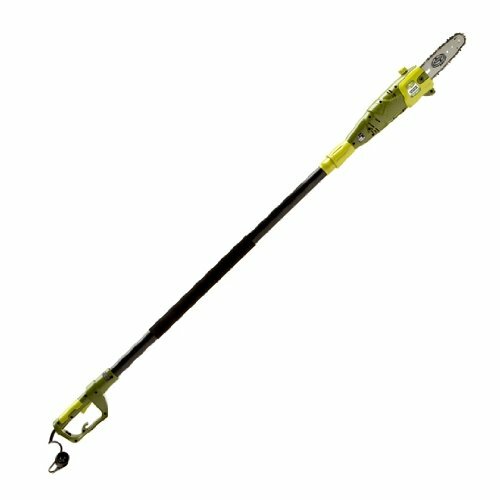 This unit also features an in-line power-head allows easy maneuverability and visibility between branches. Unit disassembles for easy transport. Perfect for transporting to the worksite. The lightweight design makes it easy to use. When you need to go that extra mile, Remington has you covered. Taking down hard-to-reach branches is one of the most important parts of yard maintenance. This 2-in-1 pole saw/chainsaw features a full wrap handle allowing for more maneuverability and versatility while cutting. And because the cord and handguard are always at the bottom of the pole, there are fewer snag hazards when you’re in pole saw mode. That’s good when you’re trimming branches up above your head. It also features a push-button quick change that allows you to convert to a chainsaw easily, without tools, so you can cut up those downed branches in no time. When you need to go that extra mile, Remington has you covered. Taking down hard-to-reach branches is one of the most important parts of yard maintenance. The 2-in-1 Ranger pole saw/chainsaw has two adjustable aluminum poles that extend 10-feet to give you extra strength and improved reach. 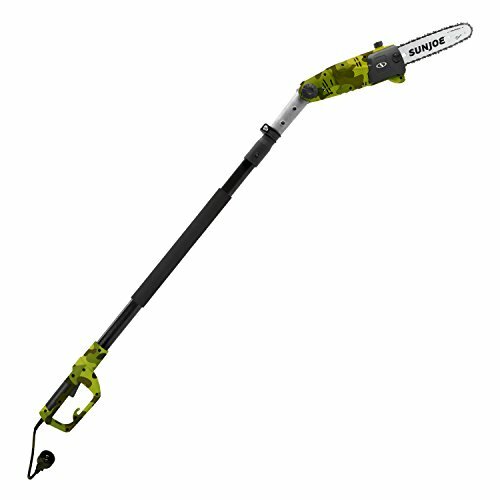 The instant start, electric 8 amp motor helps you power through branches quickly and the low-kickback 10-inch bar and chain makes lopping and pruning simple. Then when you’ve finished using the tree trimmer to take down branches from above, the easy flip and lock clamps mean you can immediately disconnect and get down to cutting those downed limbs. The Ranger is equipped with anti-rotation pole design for stable use, and a non-slip grip for added comfort. The 2-in-1 detachable saw converts with no tools required. Remington offers a 2-year limited warranty. Manufacturer note: It is normal for bar and chain oil to seep from the unit when not in use. Please take this into consideration when storing the unit. The WORX 2-in-1 pole saw and chainsaw is unique and multifunctional. Attach the 8-foot extension pole to reach higher limbs without using a ladder - detach the pole to easily chop up the fallen limbs. The pole attaches with no tools making it quick and convenient to transition from a chainsaw to a pole saw. This low-maintenance saw has a patented auto-tensioning chain system to help extend the life of the bar and chain. In addition, the automatic, tool-free chain tensioning system and automatic oil pump with level indicator makes it even easier to operate and maintain. 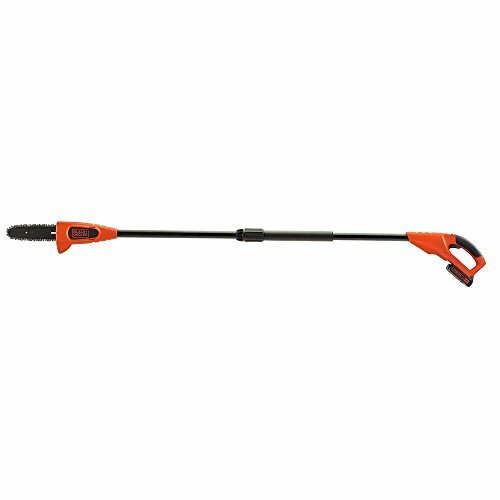 This 10-inch compact powerhouse, has a rotatable handle for efficient pruning. The WORX WG309 has a powerful 8 Amp motor and versatile design, making it the perfect yard tool for light to medium duty trimming, lambing, pruning and clean up around the yard. TACKLE YOUR TOUGHEST TREE-TRIMMING TASKS. 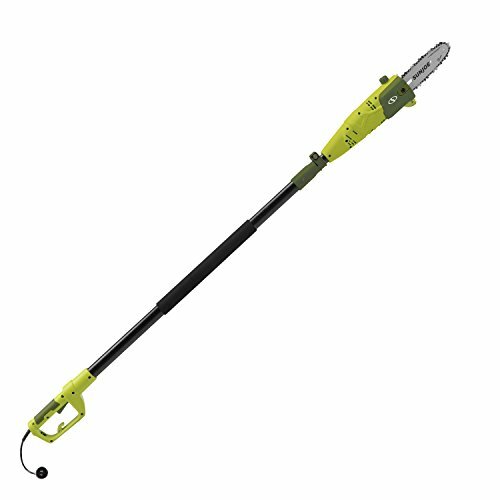 Stop straining for those hard-to-reach branches and stand safely on solid ground with Sun Joe’s SWJ801E electric pole chain saw. SWJ801E’s adjustable telescoping pole easily extends to over 8-feet for up to 15 feet of overhead reach. 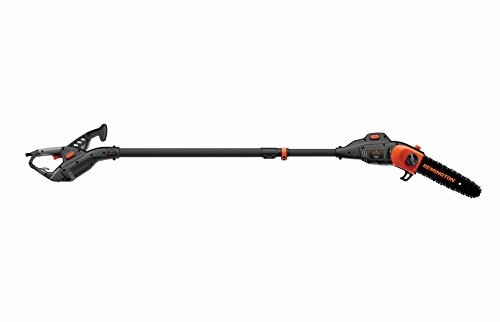 Powered by a robust 7-amp motor, it’s lightweight and easy to handle, and can tackle tree limbs up to 7.5-inches thick, and features a durable 8-inch bar and chain plus an auto-oiler to keep it fully lubricated during use. SWJ801E features a 8-inch bar and chain and an auto oiler to keep the bar and chain fully lubricated during use and a built-in safety switch to prevent accidental starts. And unlike gas-powered tools, SWJ801E is powered electrically, so you’ll reliably power up with the push of a button without having to deal with smoke, fumes, unpredictable starters or costly tune-ups. Let gravity do the work and take the danger and difficulty out of trimming your overgrown trees, and Go With Joe.